It all seemed very reasonable. Spaghetti and meatballs for a Tuesday night birthday dinner. One hour is all it takes to whip up the tastiest version of this dish and yet this hour was not to be had on May 31st when Talia turned 4. Facing a choice between a birthday meltdown over the cancellation of expected plans, or alternatively, serving dinner an hour late to a “hangry” preschooler, I opted for the latter. The risk was well worth it! Meatballs couldn’t be served fast enough. 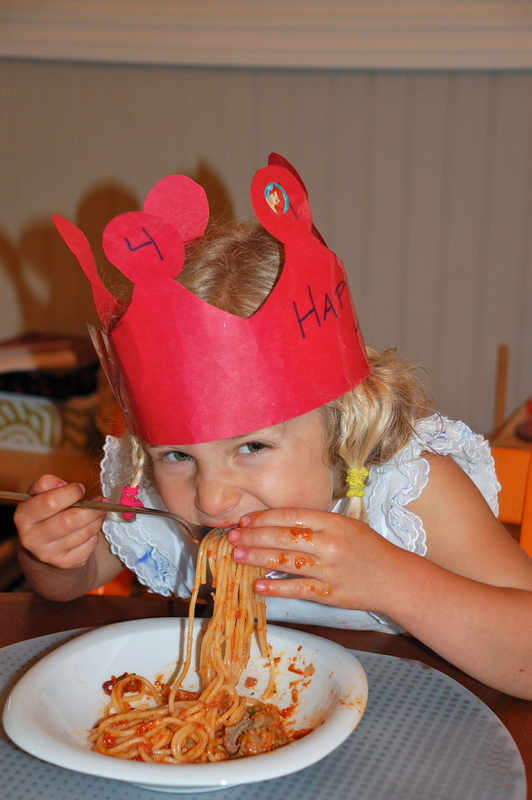 Spaghetti was slithering all over the table, the floor, the shirt, on its way to the mouth. But the entire affair was sufficiently celebratory despite the inauspicious start to the afternoon. 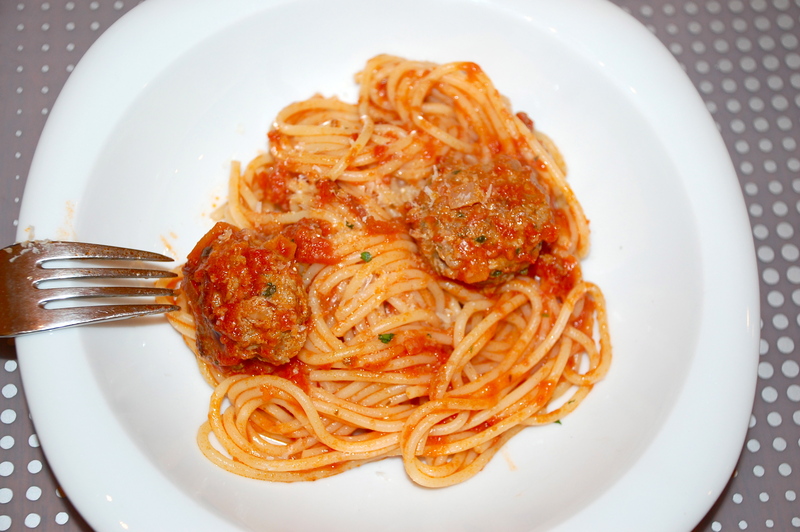 (The sauce with cooked meatballs freezes nicely – double the recipe and have some on hand for a quick evening meal). 1. Take 1/4 cup of milk and add 1/4 cup of soft bread crumbs (I used half a slice of whole wheat bread and run it quickly through a small food processor) and mix gently. Soak until bread has softened, the drain through fine sieve, squeezing out most of the milk. 2. Sauteé 1 finely diced small yellow onion in olive oil until soft, about 5 minutes, in large pan (which you will also use to cook meatballs). Season with a bit of salt and set aside to cool. 3. In a medium-sized bowl, combine: 1 pound of fresh ground beef, bread crumbs, onion, 3 tbsp grated Parmesan cheese,1 beaten egg, 2 tbsp finely chopped parsley, 1 tsp finely chopped thyme, 1/8 tsp cayenne (the mild heat from the cayenne won’t be an issue for kids but adds great flavor), black pepper to taste, and 1 tsp salt (use a bit more if working with kosher salt). 4. 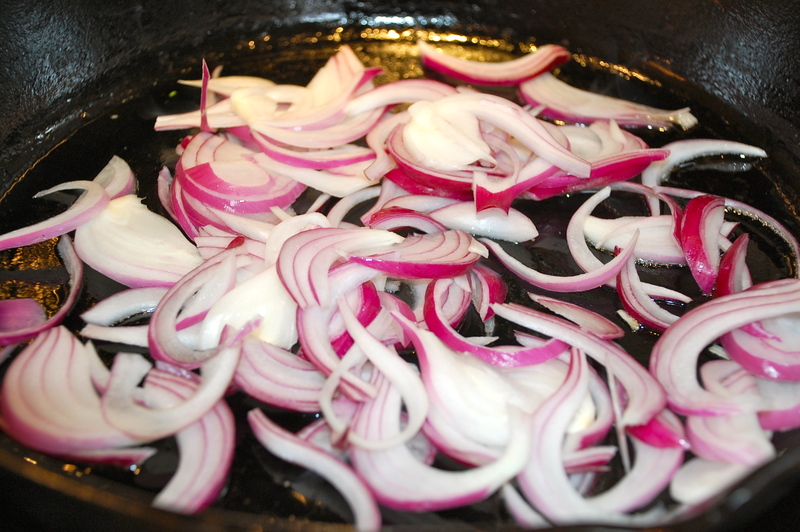 Sauteé 1 thinly sliced red onion in large pan until soft, about 5 minutes. 5. Boil water for spaghetti. Don’t forget to add a generous helping of salt to water once it comes to a boil. 4. Mix ingredients gently but thoroughly until beef reaches an even consistency. Shape mixture into walnut sized balls with wet hands – this is a great kid task! If cooking meatballs immediately, add to pan with onions over medium heat. The uncooked meatballs can also be placed on a plate or baking sheet and refrigerated for a few hours before cooking. 5. Add spaghetti to boiling, salted water. It is should cook in 8-10 minutes, about the time it takes for the meatballs to finish cooking. 6. 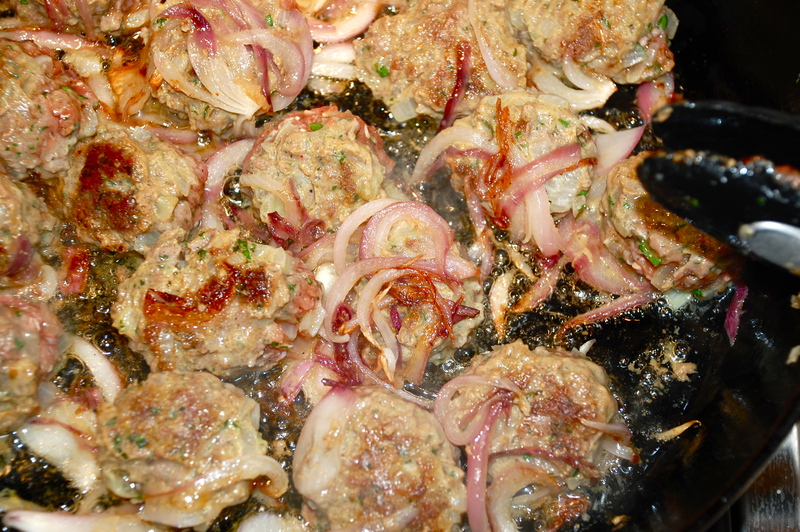 Cook meatballs with the red onion, over medium heat, shaking the pan to prevent sticking. Gently turn and toss the onions and meatballs so they brown slightly. 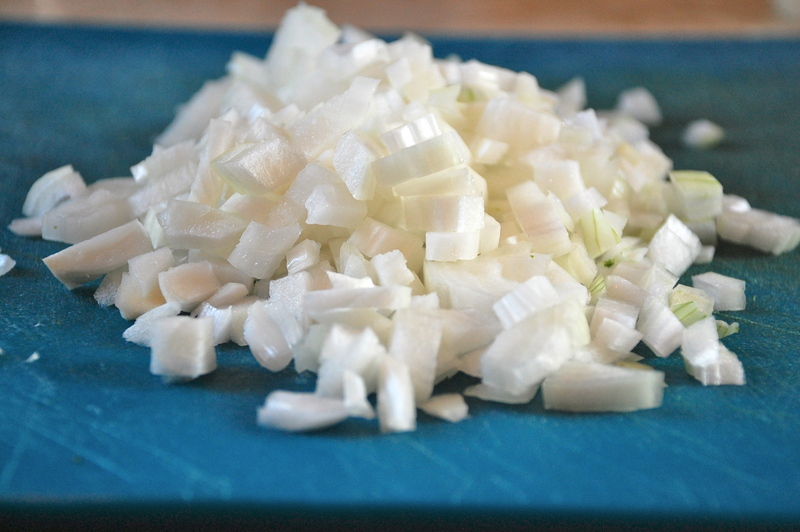 Add 2-3 cloves chopped garlic and cook for a few seconds, making sure it doesn’t burn. 7. 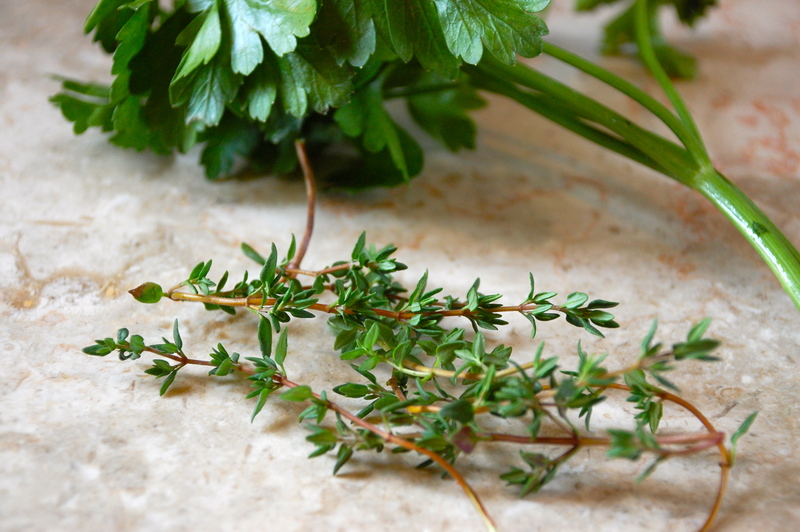 Add 2 cups simple tomato sauce (look for one in a glass jar with few ingredients – tomatoes, onion, garlic, olive oil, basil perhaps), 1/2 tsp fresh (1 tsp dried) chopped oregano, 2 tbsp finely chopped parsley to sauce. Season with salt and pepper. 8. Simmer gently, uncovered, occasionally stirring the meatballs to coat them with sauce. Check for doneness in about 8-10 minutes. Serve with grated Parmesan cheese and hot chili flakes if desired (and don’t forget the birthday cake!). I just finished the last meatball and am already missing this meal! I followed Lena’s “Spaghetti and Meatballs” recipe but used ground turkey meat instead (that’s what I had at home) and added 2 cloves of garlic to the meatball mixture, as turkey meat can use some additional flavoring in my opinion. The meatballs turned out very flavorful and our family has enjoyed this meal over the past several days. Thank you, Lena, for the inspiration!